First of all, it seems that the best time complexity we can get for this problem is O(log(n)) of add() and O(1) of getMedian(). This data structure seems highly likely to be a tree. We can use heap to solve this problem. In Java, the PriorityQueue class is a priority heap. We can use two heaps to store the lower half and the higher half of the data stream. The size of the two heaps differs at most 1. Very similar to the above solution, but much more intuitive. It actually also ran faster. // Basically Collections.reverseOrder() makes your PriorityQueue a “maxHeap”. Otherwise, its a minHeap by default. // Adds a number into the data structure. // Balancing minHeap and maxHeap. They should either have equal number of elements or differ by a size of one. // If num is less than or equal to median, we should be putting it in maxHeap. 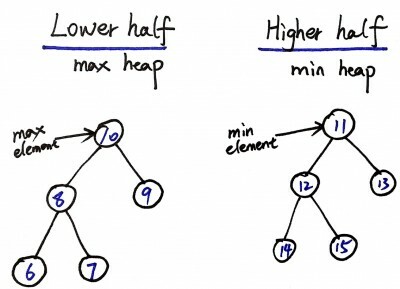 // If maxHeap size is lesser than or equal to minHeap size, put it in maxHeap. // adding the num to maxHeap, since we made some room in the maxHeap. // If num is greater than median, we should be putting it in minHeap. 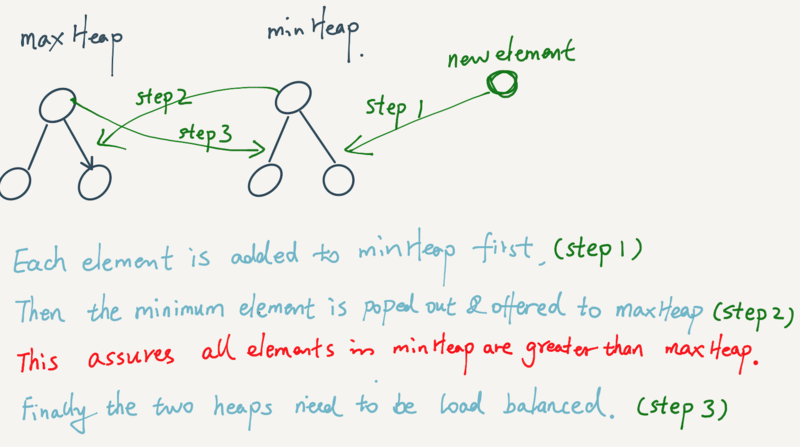 // If minHeap size is lesser than or equal to maxHeap size, put it in minHeap.